Sometimes a little knowledge of the ingredient we use can help make us better equipped for the job; in this case better bakers. What is baking powder? what is baking soda? Why are they important in our baking. This post explains the difference between them both and more. Why are they so important in baking? Can they be omitted in a recipe? What happens if I don’t have it at home? How does it effect my recipe? Not to scare you but a few of us who bake often might go thru these which results in us going to dig for answers to the above? You start baking your favorite recipe when you suddenly notice. No baking powder and only have baking soda? Or your baking powder is expired!! The worst is when you already baked the cake or cookies only to realize that they are all baked flat because the leavening did not work! Did any of you these above scenarios get you to this post? The first time I went digging for answers was when my cookies were flat out and mom said – your baking powder must have expired. What? It has an expiry? Where? How? read read read.. over the years we’ve learned some from reading and some by trail and errors. Making a food out of yourself in the kitchen can be a great learning experience – ask me how I know? Anyway, so let’s explore Baking powder vs baking Soda – shall we? Nah I’m not going to bore you with details and tell you the chemical and alkaline etc…. 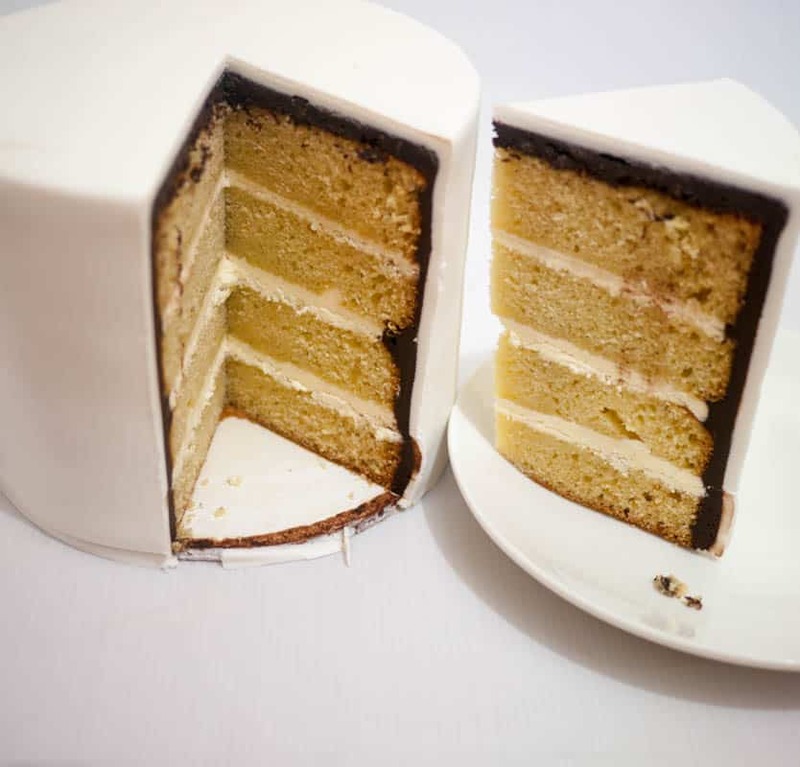 Let’s keep it simple to how it’s important to our baking – shall we? First off…. the basic difference. Pro – Releases Carbon dioxide which helps cookies and bread rise. 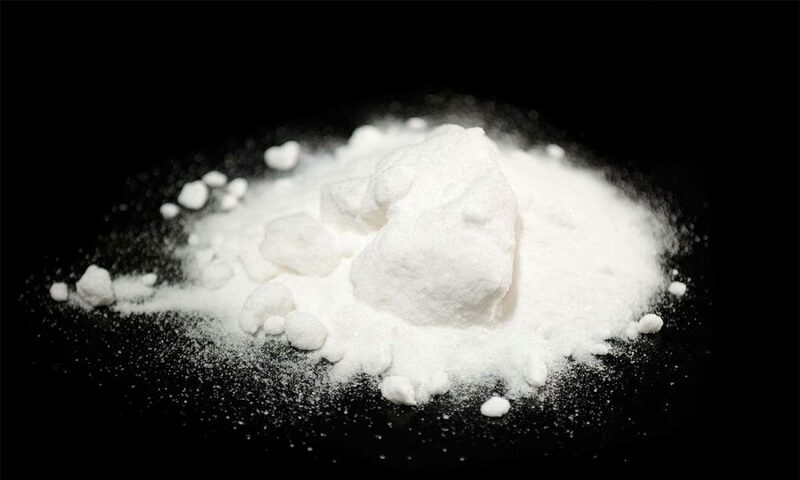 Cons – also produces sodium carbonate, which doesn’t taste good and can give your baked goods an weird after taste. Cakes can be crusty with hard crumb. Too much can lead to reddish ting. Works best used when you are using an acid ingredient such as Lemon juice. For example. Do not Substituting Buttermilk with Milk in a recipe. Your taking away the acid – instead add lemon juice to the milk so the baking soda can work better. Baking powder is basically just baking soda with acid added in. It has just enough acid to use up the sodium carbonate. Making it more safer to use. Baking powder works in two stages – as soon as you add it to the batter and then when it is heated in the oven. Therefore it is better to bake the batter as soon as it is combined. Hence the practice grease and line pans first so you don’t waste time once the batter is ready. 1 tsp. baking powder has 1/4 tsp. 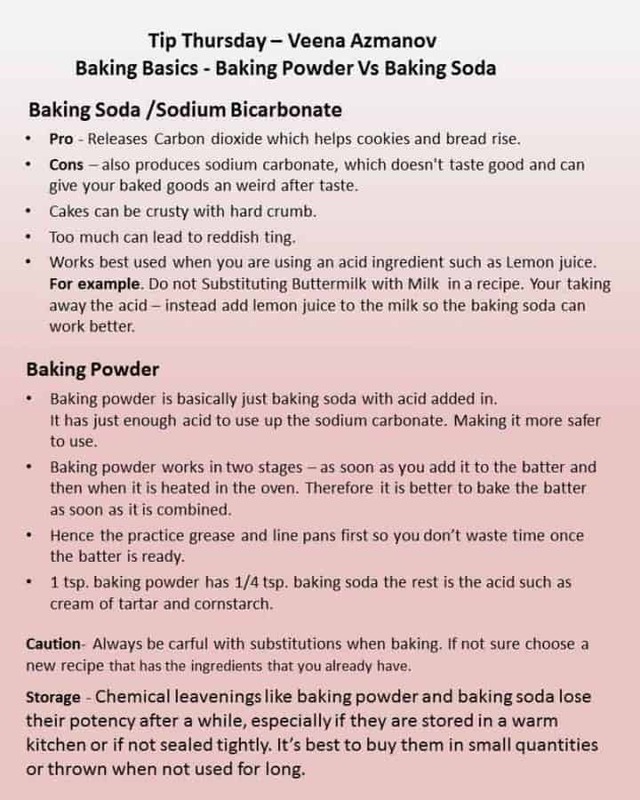 baking soda the rest is the acid such as cream of tartar and cornstarch. Chemical leavening like baking powder and baking soda lose their potency after a while, especially if they are stored in a warm kitchen or if not sealed tightly. It’s best to buy them in small quantities or thrown when not used for long. The best way to find out is to test them when not used for long. 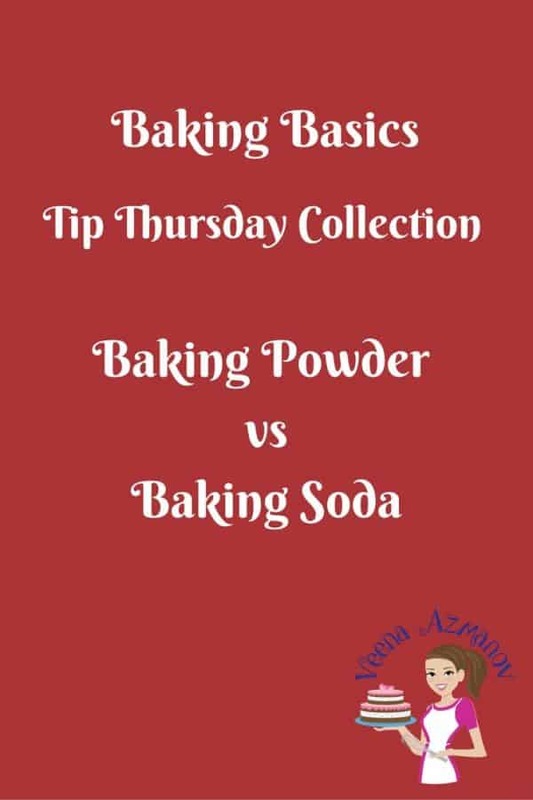 How to test Baking Powder Vs Baking Soda. Testing is really simple and easy so it’s best test rather than take chances. The easiest and quickest way to test Baking Soda is to put it in a small bowl, add a little vinegar to it. If it bubbles up it’s good. I bet you now remember those volcano experiments we did as kids in science class. Yup! that’s the same. A simple way to test Baking Powder is just put it in a small bowl, add some water. It should immediately foam up. It if does it’s good!! Can you substitute one for the other? 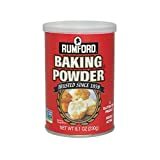 Baking powder Vs Baking Soda? Well, as I said above baking powder is usually made with Baking Soda, plus some acid such as cream of tartar and cornstarch to keep it from caking up. Honestly it’s best not to substitute baking soda for baking powder – why? If you going to substitute baking powder for baking soda -you going to need a lot more of the baking soda. For example one tsp of baking powder has only 1/4 tsp of baking soda – so if you recipe says 1 tsp of baking soda you would need 4 tsp of baking powder. Right? Not to mention you are also going to add all that extra acid (cream of tartar) and cornstarch with it. So you may end up with a bitter taste. On the other hand you can easily substitute baking powder. Baking Soda is of course three times as powerful as baking powder so you will need to use much less in the recipe. And you will need to increase the amount of acid in the recipe which means you just need to add either a little bit of cream of tartar or vinegar or lemon juice. Baking Powder – best to be made fresh at the time of baking of course. For one tsp of baking powder – you would add 1/4 tsp of baking soda + 1/2 tsp of vinegar or lemon juice. So here’s today’s Tip Thursday. You can find more on Pinterest and Save a collection of these. 1tsp baking powder, 1\4tsp baking soda,1\2tsp lemon juice , for 1cup flour? Yes, Laxshmi. That’s sounds about right.